Professor Arthi Jayaraman received her B.E (Honors) degree in Chemical Engineering from Birla Institute of Technology and Science, Pilani, India in 2000. She received her Ph.D. in Chemical and Biomolecular Engineering from North Carolina State University in 2006, and from 2006-2008 conducted her postdoctoral research in the department of Materials Science and Engineering at University of Illinois-Urbana Champaign. In August 2008, she joined the faculty of the Department of Chemical and Biological Engineering at University of Colorado at Boulder, and held the position of Patten Assistant Professor. In August 2014, she joined the faculty at the University of Delaware as Associate professor of Chemical and Biomolecular Engineering and Materials Science and Engineering. Her research expertise lies in development of theory and simulation techniques and application of these techniques to study polymer functionalized nanoparticles and polymer nanocomposites, and to design macromolecular materials for biomedical applications. 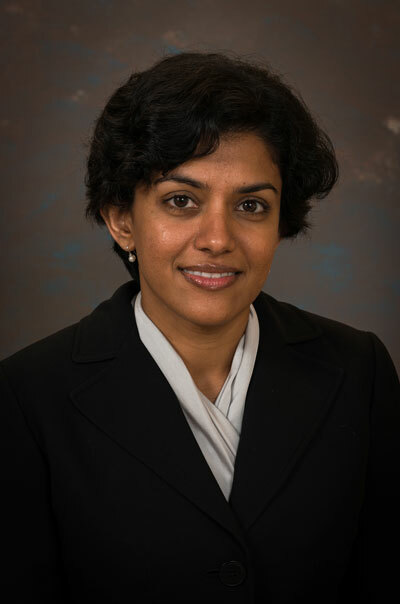 Her research has been recognized with the Dudley Saville Lectureship at Princeton University (2016), the AIChE COMSEF division Young Investigator Award (2013), ACS PMSE division Young Investigator (2014), University of Colorado Provost Faculty Achievement Award (2013), and Department of Energy (DOE)Early Career Research Award (2010). Her teaching has been recognized with the University of Colorado outstanding undergraduate teaching award (2011) and University of Colorado outstanding graduate teaching award (2014) in Chemical and Biological Engineering.